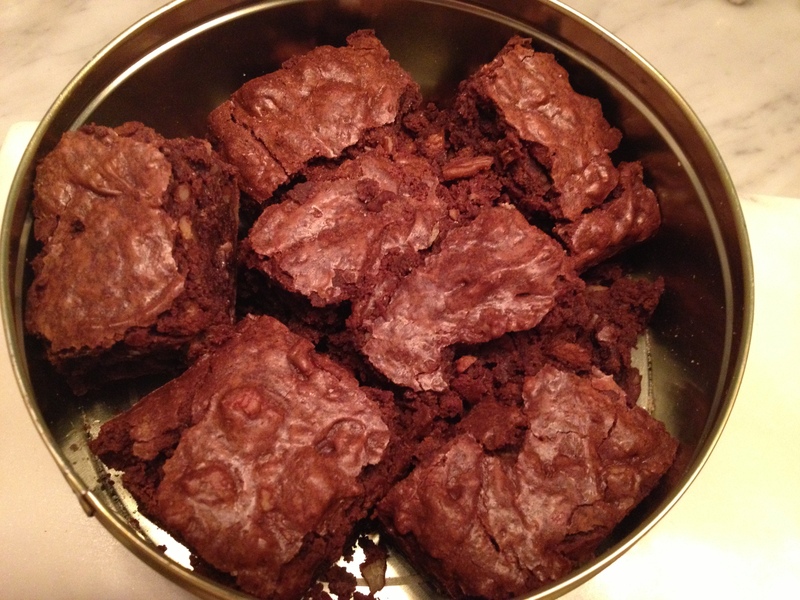 In the original recipe from Short and Sweet by Dan Lepard … these are called Bourbon Pecan Brownies – what I have found is that they work well with several different kinds of brown booze – Rum, Whisky, Rye or Brandy in addition to, off course Bourbon. I haven’t tried them all yet but I think I like amber rum best. All of this to says it’s good to know that if you have a hankering for brownies but don’t have any bourbon in the house you can still make them. Of course if you want you can make them without booze all together. Rich, intense chocolate, with a wonderful depth of flavor from the alcohol and that wonderful sweet crunch of Pecans. 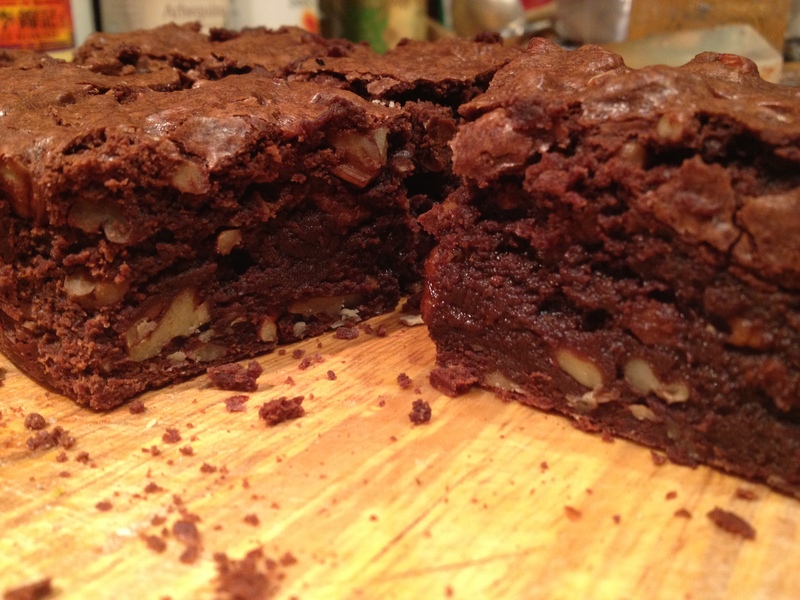 I’m always in a constantly searching for the best brownie recipe and I’d say this makes it into the top three. I have modified the original recipe slightly. Line an 8″ square tin pan with tin foil. 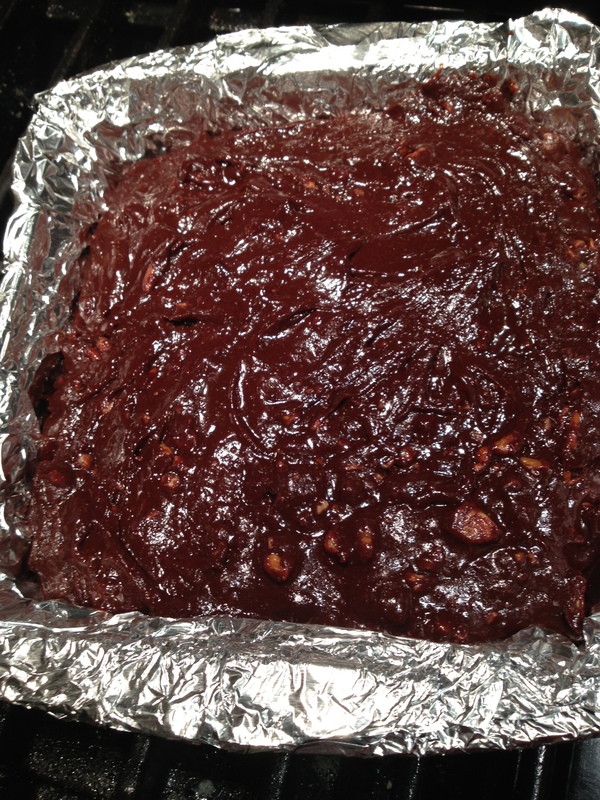 Sift 1 Tablespoon of Cocoa, 1/2 Teaspoon salt and 1 1/3 cups of All Purpose Flour twice into a small bowl and set aside. Over a pan of barely simmering hot water place a medium bowl with 9 Tablespoons of unsalted butter and 8 ounces of dark chocolate stirring until completely melted then immediately take off the heat and put aside. In a large bowl beat 2 large Eggs, 2/3 cups brown sugar and 1/2 cup white sugar until creamy and light (about 2 minutes). 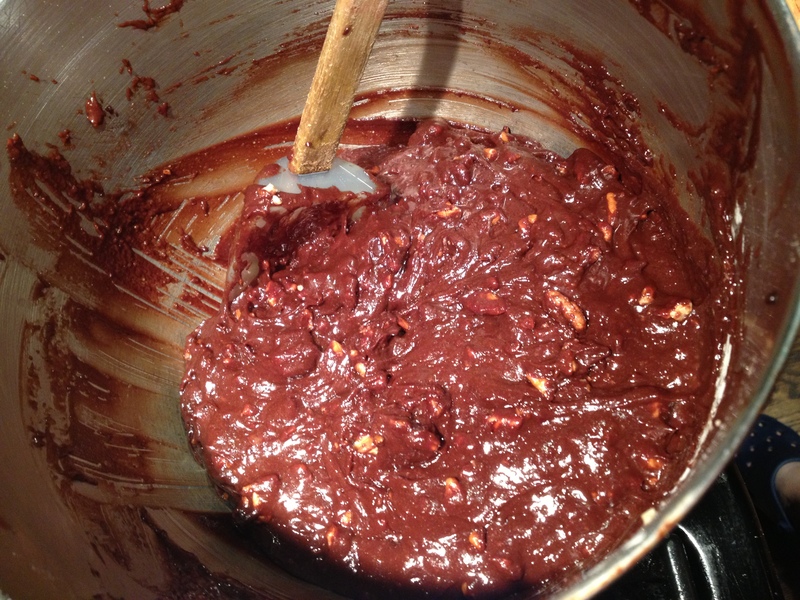 Fold in the chocolate mixture, once well combined add 1/3 cup Bourbon (or Rum or Whisky or….) and 2 Teaspoons of Vanilla extract. Once well incorporated fold in (a spatula works best) in the flour mixture – once it has been well incorporated add 1 1/4 Cups roughly chopped Pecans (or Walnuts). Spoon into the prepared pan and bake for 25-30 minutes or so – remember a little gooey is better than a little dry! A caked tester should come out barely clean maybe even a little crummy. 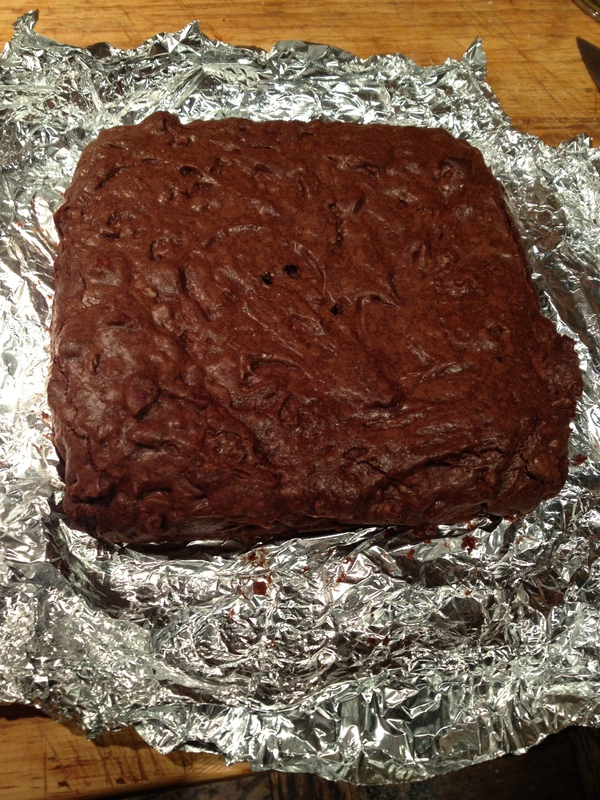 Once out of the oven let the brownies sit for a good 15 minutes before cutting them. Vanilla ice cream makes these into a full fledge decadent dessert worthy of any dinner party. Just plain with coffee works just as well. 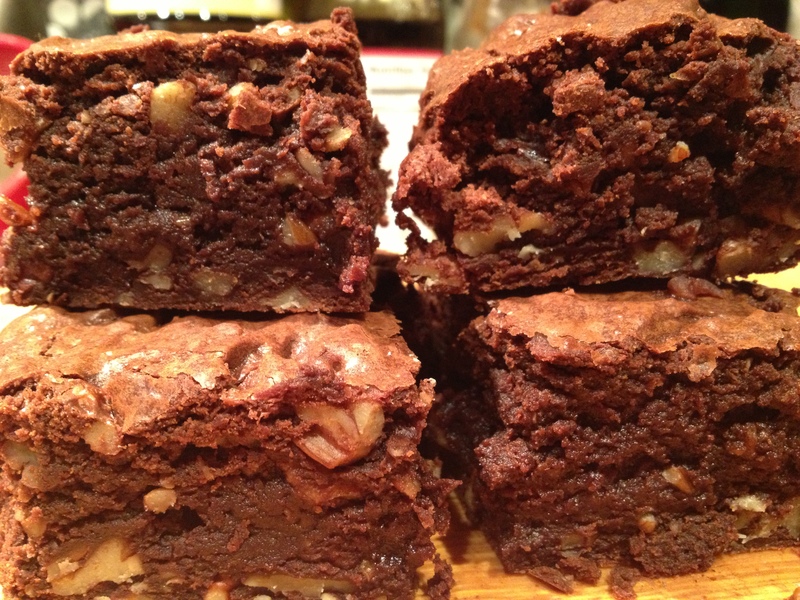 This entry was posted in Recipes and tagged boozy pecan brownies, Dan Lepard, recipes, Short & Sweet. Bookmark the permalink.